Emotional experience at the the Museum Palazzo Davanzati , the ancient Florentine house. Davanzati Palace was the former house of the family of Davizzi, merchants and bankers of Florence and then belonged to the Davanzati, another rich family. 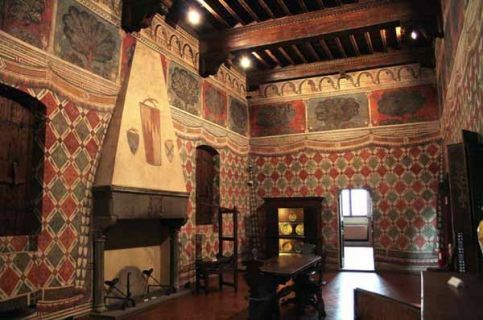 Today the building houses the Museum of the Ancient Florentine House, where it is still visible, in a journey through the time, the habits of the aristocracy of the 14th anf 15th centuries in Florence. The Museum of Palazzo Davanzati retains inside an exceptional collection of artifacts, paintings and furniture that tastify the various changes of ownership and different us have occurred during the passing of time. Palazzo Davanzati Tour. Avoid long lines at the museums! Our exclusive online Booking Service allows you to reserve your visit to any of the museums in Florence on the day and time that you want. This way you go to the front of the line with your pre-paid reservation and have more time to enjoy inside the museum. Delight in all that the museums have to offer with all the time that you would have spent standing in lines! Palazzo Davanzati Tour. Guided Tours: Discover the muesums of Florence (Accademia, Accademia, etc.) with the experts! Our expert-guided tours are given in the language of your choice. For those who don’t feel up to visiting the museums on their own, or for those who want to hear the inside stories, join the group tours for our special treatment. Guided itineraries include the most important sites and museums that you shouldn’t miss.